Unfortunately, the New England style warm white OceanLED Amphibian A6 transom lights I showed off in 2010 cracked and died after about four long seasons in the water (plus exposure to some harsh Maine winters). That was disappointing, but they never leaked a drop, and I’m confident that OceanLED’s newer Xtreme designs with stainless bezels are longer lasting. Besides, since then highly controllable, full color spectrum LED underwater lights came along. 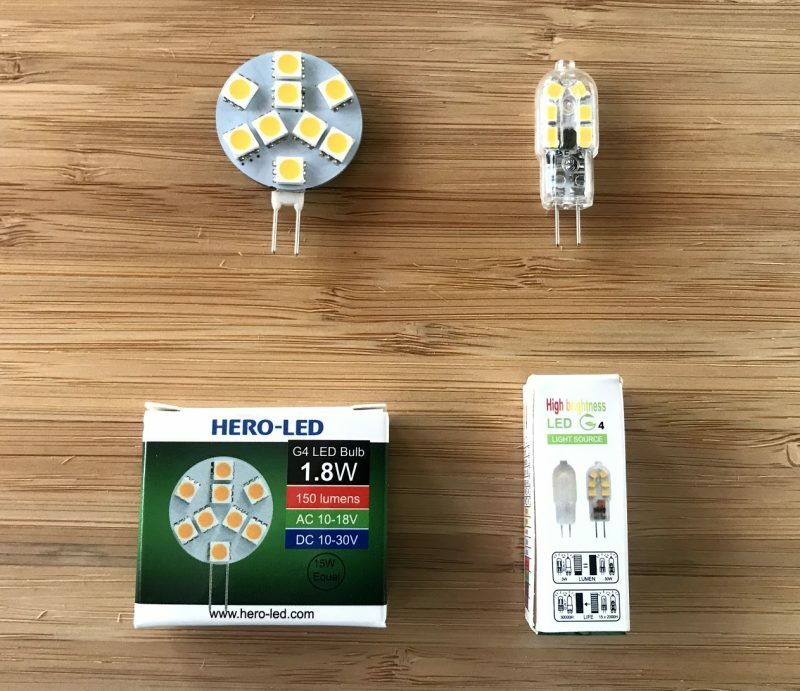 Lumishore kicked off the EOS line a couple of years ago with the Color Controller seen above along with a couple of the 10,000 fixture lumen (and 7.5 amp) through-hull fixtures it’s typically used with. I was impressed, not just by the elegant controller and all the neat things it could do with color change lights, but also because Lumishore designed EOS using the bi-directional and open DMX512 RDM lighting standard. Thus, the lights can easily integrate with music sources and can even be run by third party controllers like Crestron, plus the fixtures can report all sorts of diagnostics (as I illustrated after NMEA 2015). However, the kit above with 1 Color Controller and 2 THX801 lights retails for $6,799, and Dynamic Color Sweep isn’t going to be very spectacular with just two lights. 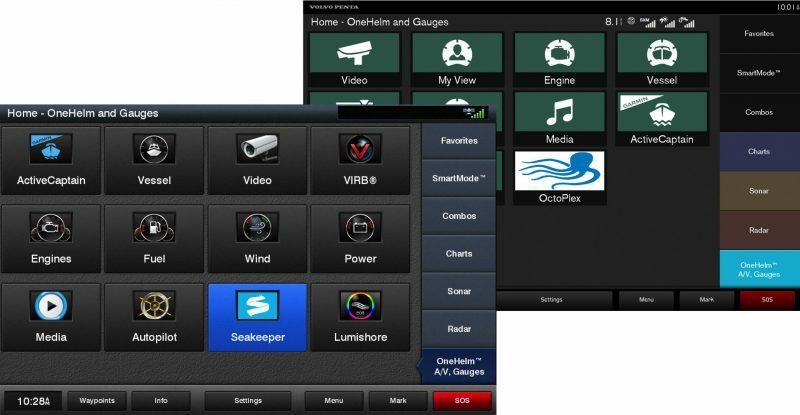 But then Lumishore introduced the EOS Surface Mount color change system with nearly all the big yacht features — depending on which of three controller models you’re using — at a substantially less painful cost. A complete starter kit with the one Mini Controller and two 4,000 lumen SMX92 fixtures retails for $2,869, and even the $1,119 single SMX92 with just a Lumi-Switch control can grow into an eight light system mainly with some more fixtures and 1/2 inch holes through your hull. That’s because each kit comes with a Lumi-Hub distribution box that uses CANbus-like power and data DMX cables to “Plug’N’Play” up to four lights, and a second Lumi-Hub can be added to the control system with just another cable and a power feed. The table above shows what each controller can do, and you’ll also see that the WiFi version of the Mini can enable the EOS app that was developed to go with the Color Controller. And when I asked if it was possible for EOS to someday integrate into multifunction displays with digital switching capabilities — like what I saw at FLIBS and METS — it was all smiles in the Lumishore booth. In fact, this company has already had a good year, including winning several awards like NMEA’s first ever underwater lighting category and inking a master distributorship with Imtra. But I’m sure they’re aware as I am that OceanLED is working on its own DMX512 RDM control system, and they have several other worthy competitors as well. Now let’s close with some joyful lighting. Above is the wonderful Maine Coast Botanical Gardens AGLOW — almost 200,000 LED fixtures strong — and if you click it larger you’ll see that umbrellas were needed that recent night (and many recent nights). A chilly drizzle didn’t stop a lot of visitors; maybe such weird winter weather, and the possibility of a sick climate, increases the need for such luminous color? And below is a summer evening scene at the Camden Public Landing. It’s hard to photograph lighting well, but hopefully this suggests how beautifully symmetrical and balanced these lights looked. I had to grin because it wasn’t that long ago that a fellow member of the Harbor Committee suggested that we ban underwater lighting at the Landing. He got no support whatsoever. Wishing you all a light-filled winter solstice 2015, natural and otherwise. Any unnecessary hole in the bottom of a boat is likely a bad thing. That said these are pretty cool. I agree with Anonymous. The lights look cool. But, is there a practical use for hull mounted underwater LEDs? We like them to make bait . In Catalina they make your boat into an underwater aquarium. By installing these lights you put yourself in the same category as someone that installs 20″ chrome rims, and under-body lighting on their car. ie It does kinda scream “look at me, look at me!” A tad garish. That said I personally have no issue with these used for attracting the bait fish, or lighting up the marina for a dock-side party, but lets be clear, if you run these at an anchorage where most of us hope to enjoy the peace and escape the city lights and enjoy the stargazing, you’re being a right douche bag! Now we’re talking. I believe that “right douche bag” — which may be multilingual (and Google hasn’t heard of) — deserves an acronym for ease of use. RDB! And now let’s acknowledge that one boater’s RDB may not be another boater’s RDB. In my view, for instance, underwater lights usually look great in an anchorage, and they certainly don’t obscure the heavenly bodies like city lights do. And ditto for “garish”; I’m doubting that the sport fisherman Sandpiper (above) and undercar lighting are in quite the same “category” but personally I tend to enjoy both. And who are you kidding about “look at me, look at me!”? What in the world do you think varnished teak, polished stainless and so much else in yachting is about? And that’s OK. Finally, excuse me if I also tend to grin about questions of “practicality.” Seriously? What is practical about recreational boating? Or sport fishing? That’s not meant to be critical. I have lived a nearly life-long commitment to recreational boating, and I like to break that term into its roots… re create. It’s important, but not practical. Incidentally, my top RDB category might be pretentiousness. In general I have nothing against cool lighting on boats. It looks nice, and it’s fun. However please make sure the lights are installed properly and turned off before you go to bed when in a marina. Having someone’s high powered lights glaring through your windows (with closed curtains) all night long puts you on the RDB category. I have the lumitec seablaze white and blue on the back of our 46 foot trawler! Wife loves it, daughter and friends will watch fish and crabs for 1 to 2 hours when we are anchored out! I am happy I did it, wish I would have done it sooner! I mounted mine with starboard off the swim platform, so no hull penetration below the water line! Coast guard also liked it while boarding underway after dark! Despite the detractors, underwater LED lights can have a very positive benefit for boats. First, mounted just forward of the prop on a racing sailboat, you can instantly confirm the presence of kelp or other debris on the prop and leading edge of the rudder. Second, mounting lights near the waterline at the stern makes boarding from a dinghy so much easier without the blinding effects of spreader lights on deck. Also nice for rescue of a swimmer, night diving, etc. Third, and previously noted, fishermen have a distinct advantage at night, especially if you are a fan of squid. And fourth, if you want to attract immediate attention from another vessel or rescue aircraft, light up the water! And let me add underwater lighting benefit number five: looking good. Hope everyone is having a Merry Christmas and/or Happy Holidays. As I sit here in Hometown Abaco on a particularly windy night the Marlow next to us has bright blue lights that brghtiy flash the Harbor each time a wave passes by. After listening to the complaints of many boaters I finally asked them to shut them off by showing them the blue lights flashing over the sides of the neighboring boats. Looking down I expected to see them popping out of the waves but they were only close to the surface. Thankfully they were accommodating and indeed shut them off. I’ve seen many glow lights before but this was the worst implementation. I’m sure the owner did not intend this, but clearly more active education is needed. Here is a new product by jellux that lights up your dock with the first and only LED Illuminated dock bumper!! A few people ask “why?” The answer is why you bought the boat in the first place: fun. When the mood takes you, they’re beautiful to look at. Night time swimming in a warm sea is awesome. I am sensitive to being a RDB in anchorages but many times when I turn them off the other boats shout “hey mister! turn them back on please!” Many times also kids from other boats have come over to swim in the pool of light, and called out music tracks (like I’m their personal DJ!) to play with the sound to light function. We’ve had quite a few impromptu parties. And at a mundane level, when you are transferring people between mother ship and tender it is 10x nicer and safer if the water is glowing.